Dancing LED water fountain speakers from Leading Edge are the coolest and most amazing lighted water speakers available today. Ice Cold Mist is proud to be one of the select few authorized locations for Leading Edge Water Dancing Speakers. The original water dancing LED speakers provide big sound from a compact portable speaker, while the all new X3 speakers boast 6 jets of mutti-colored water. The illuminated multi-colored water dances to the volume and the beat of the music. 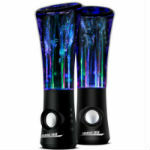 Your friends will be amazed and you will be the hit of the party with our dancing water speakers. Leading Edge LED dancing watershow speakers provide high quality sound and are completely portable and easy to use. The speakers connect to computers, Android phones, iPhones, tablets, iPods, XBox and other game consoles. Simply plug them into any USB power source and the dancing water speakers jump to life. Everyone from children, teens and adults love the dancing water show speakers. Leading Edge dancing water speakers are the original and only patented dancing water speakers available today. They offe the highest quality and reliability of any water speaker. This is the reason our dancing LED speakers receive so many 5 star customer reviews. Cheaper internet knock offs can leak or suddenly stop playing music. When you buy our Leading Edge original dancing water speakers, your purchase is backed by a full 1 year manufacturers warranty giving you peace of mind. 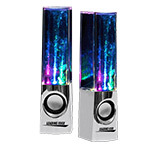 We offer our dancing water speakers at the lowest prices without the need for discount coupons or promo codes.